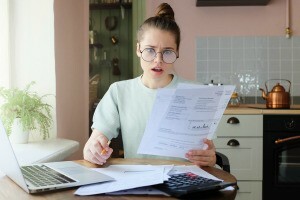 Receiving a utility bill that is unexplainably high is initially a shock. Then the question is what is wrong. With a high electric bill, sometimes the culprit is a malfunctioning appliance. This is a guide about troubleshooting the cause of a large electric bill. My electric bill is outrageous! A fellow employee/electrician gave me a meter to measure amp draw on each of my breakers. All of my 15A breakers average around 4A. I have 2-30A breakers running my water heater and the same set up for my washer/dryer. The water heater is drawing about 17A and the washer/dryer (while running) draws about 19A. What could be the most likely cause of my high electric bill? I would call the electric company and have them check out the meter, maybe replace it. When the meter reader comes ask him how many kwh you used for the month and check that against you bill. You could also ask the electric company if they have a serviceto find the appliance or what is drawing so much current. One big pull on electricity is the computer/printer/modem staying plugged all the time, and the tv/vcr/dvd/etc plugged in at the living room. Even when these machines are 'off', if they have any glowing light on them, they are pulling electricity. The best way to solve that is to get a surge protector for the computer area, and one for the tv area, plugging each appliance in, and then you can turn them all off or on by just using the switch on the surge protector. Also make sure that your microwave, programmable coffee pot, etc are unplugged when not in use, as any appliance with a timer, or clock constantly showing will draw electricity as well. One cause might be if your meter was estimated for several months instead of an actual reading then it was read, you may have paid a lower bill on estimated use and the power company is now charging you for actual use. Another one might be your air conditioner, this pulls a lot of power to cool and it has been very hot this summer. My last thought is that it could be a neighbor using your outdoor outlets for something like cooling during the day while you are at work--don't laugh it happens! Good luck. Can you turn "all" of your breakers off for just five minutes (including refrigerator, etc.) and then look at the meter to see if it's still running? If all of the breakers are off and it's running still you need to call your electric company to come out and take a look. It could be a defective meter and, sadly if you have neighbors right next to you, could be someone has hooked themselves up to your electric. The easiest way to make your home more energy efficient is to seal any air leaks, and one that is often overlooked is the bathroom ventilation fan and exhaust vent. The back-draft flap these units come with do a very poor job of stopping leaks. To address this issue, I use a replacement insert fan from the Larson Fan Company (online). Their fans has a true damper built in, that does a great job in keeping warm air in during the winter and hot, humid air out in the summer. This product has reduced my annual energy bills by over ten percent. It saves the most when air conditioning is being used. I live in a 2 bedroom, 1 bath older home in the country. Ever since I've moved in 2 years ago my electric bill has been $400-600 a month. This month it was $600 and we haven't used AC or heat (even though we have to use gas and I haven't ordered any this year). We have well water and I had someone come check the water and there were no issues. Can someone help me figure this out? Do call the electric company, and tell them you want your meter checked. Ask about any fees associated with having this done. Another reason could be that neighbors, or something else on property is robbing electricity from you, and youre paying the bill for it. Maybe someone is running an extension cord from an outbuilding? Were you previously on a percentage of income plan with your company? If you elect to do that, you are eventually responsible for the entire unpaid balance. If the company comes and checks your meter and determines that there isnt a problem they will charge you a fee, for my company its about $100-$200 but thats just a drop in the bucket compared to a $600 monthly bill! Something just isnt right, and it could be a number of issues, but having the meter checked would be a good first step. If thats not the problem I would contact an electrician. Also, you dont specify whether you are buying, or renting. But if you rent, it is your landlords responsibility to figure out, and remedy the problem. To double check, your electric bill is per month cycle? It is where I live and $400-600 is definitely not normal especially for just 2 bedroom/1 bath. Do you have any neighbors you could compare your bill to theres? I would contact the electric company and ask them about your electricity on why it is so expensive especially if you're not running A/C or Heat. I agree that I would ask some of the neighbors about how high their electric bills are because that sure seems very high for such a small place. I would also suggest paying a visit to the electric company and find someone to discuss this high cost with. They may have some ideas for you to check before you have to pay a big fee for someone to pay a visit. Since it is an older home you may have old wires and that may be part of your problem but replacing wiring is costly so whether you are buying or renting would make that something to consider. If you are renting then you should discuss these high bills with the landlord as that is part of their responsibility also. It is possible there is a problem that is also an unsafe feature that you are not aware of. Last resort would be to have an electrician check your house and give you an estimate of what it will cost to fix the problem. When you bought, did the Realtor share previous bills with you? That is standard where I am. If not, perhaps the Realtor can see if the previous owner had issues (a long shot after 2 years, but it could help you get closer to finding the issue). is it possible the electric company did not take your previous property off your bill and you are being billed for services at a previous residence and your new residence? Stranger things have happened. Do you have a use grid on your bill showing when they see peak usage? If it is while you are not home, that could give you more info. Do you have outdoor outlets? Is it possible someone is hooking up to this when you are not home? I love solving mysteries so I can't wait to hear what you learn. Please post back. Hope it is something super easy and it gets resolved. If it is their fault--like a bad meter, I would hope they would make it right for you. I would really like some advice because I'm in a terrible situation. My electric bill is usually around $100 to $110 and now this month it is showing up as $443! That's outrageously high! We contacted the electric company and they told us that it might be an appliance that's malfunctioning for it to be consuming extreme energy. The thing is how can I tell which appliance it could be? The electric company said that it could be our water heater, but is there any way to tell which appliance is consuming that much energy? I would have them check the meter first. This happened to an entire community not far from where I live. Turned out to be the company's fault. I suggest asking all your neighbors about it and perhaps contacting a local news reporter (although those are becoming fewer and farther between). Oh no! That is extremely high to jump - were there any changes from your previous months to now? Did you run any appliances more than usual like air conditioning during peak hours or something? I would definitely ask around the neighborhood to see if anyone has the same issue. Also ask your electric company if they can come out and assess your meter and to find the cause as you've been a regular customer who's bill averages around the same each month!